Matthew Brown is a financial planner as well as a home brewer. But not just any home brewer. Brown is so invested in his craft that the Maine Brew Bus made a stop at his house in Portland’s Back Cove so customers could visit his basement brewing operation during Portland Beer Week. As one might imagine, this basement constructed in 1913 wasn’t quite up to snuff for this increasingly commercial venture. “There were times when I could see my own breath,” Brown says. “That’s like the financial equivalent of burning twenty-dollar bills.” He also had problems with water getting into the basement. Cold and damp isn’t exactly a hospitable environment for serving beer. Last summer, Brown made an appointment with a local energy auditor, Molly Toothaker of The Heat Doctor, to get an assessment of his home’s energy efficiency and recommendations on how to make it warmer and drier while taking advantage of Efficiency Maine’s rebate programs and saving on fuel consumption. At Brown’s house, The Heat Doctor crew blew in dense- packed cellulose insulation in the attic and closed-cell spray foam in the knee walls and basement. Brown was already a serious home brewer, but having a warm and comfortable basement made all the difference. While few of us serve ales, lagers and IPAs to busloads of strangers in our basements, the benefits of an energy audit offer a similar level of opportunity for most homeowners. “The value of an energy audit is to have an expert, informed plan before you start to invest money,” says Andy Meyer, residential program manager for Efficiency Maine. “You can always improve energy efficiency, and the best places to start can [often] be [the most] cost-effective,” such as caulking between the foundation and the house or sealing the holes created during the installation of electric or plumbing. “All those little holes are inhaling air from the outdoors at the bottom of the house and exhaling at the top of the house,” Meyer says. Energy advisors are trained in the house-as-a-system approach, taking into consideration the delicate balance of air quality, energy performance and comfort. Most energy advisors start by talking with the homeowners about their goals—whether they’re motivated by saving money, increasing comfort, reducing their carbon footprint or improving the air quality in anticipation of a new baby, for example. The homeowner might be tired of drafty rooms, disturbed by noise from the street, or have ice dams forming on their roof. The energy advisor will typically start with an informal walk-through, making hypotheses based on what they’ve seen in similar houses over time. Then they break out the measurement tools, including a blower door and an infrared camera, to pinpoint exactly how much air—and, therefore, heat— is escaping and where. With that baseline established, the energy advisor proposes solutions accompanied by cost estimates and how long the upgrades may take to pay for themselves. An audit and simple air sealing can sometimes be performed for as little as $600. When you factor in the available $400 rebate from Efficiency Maine, that leaves an out-of-pocket cost to the homeowner of just $200. More often, however, the audit reveals that significant energy savings can be achieved by adding insulation or fixing other large holes, such as a leaky or uninsulated door. In these cases, homeowners may qualify for up to $2,100 in rebates. Often, the upgrades pay for themselves in fuel savings over a short period of time. A blower door—one of the most powerful tools used by energy advisors—is essentially a fabric door with a potent fan that depressurizes the house to quantify air leakage. The blower door provides the energy advisor with a measurement of the rate of air exchanges the house is experiencing in a given period of time—typically, an hour—so the house can be compared with other homes to establish a baseline of what is possible for upgrades. With the blower door still running to exaggerate air leaks, the energy advisor uses an infrared camera to pinpoint spots where heat (or air conditioning) is lost. Most commonly the leaks are in attics and basements and around windows, chimneys and stack pipes. Air sealing options include spray foam, weather stripping, latches to tighten attics and sheet metal and high-temperature caulk around chimneys. These low-cost improvements can make a big difference in the comfort of a home. A good energy auditor outlines a menu of options, keeping in mind the homeowner’s expressed concerns. Recommendations in the whole-house weatherization plan are prioritized, starting with safety issues, often followed by whatever draft sealing and insulation upgrades will give the most bang for the buck. 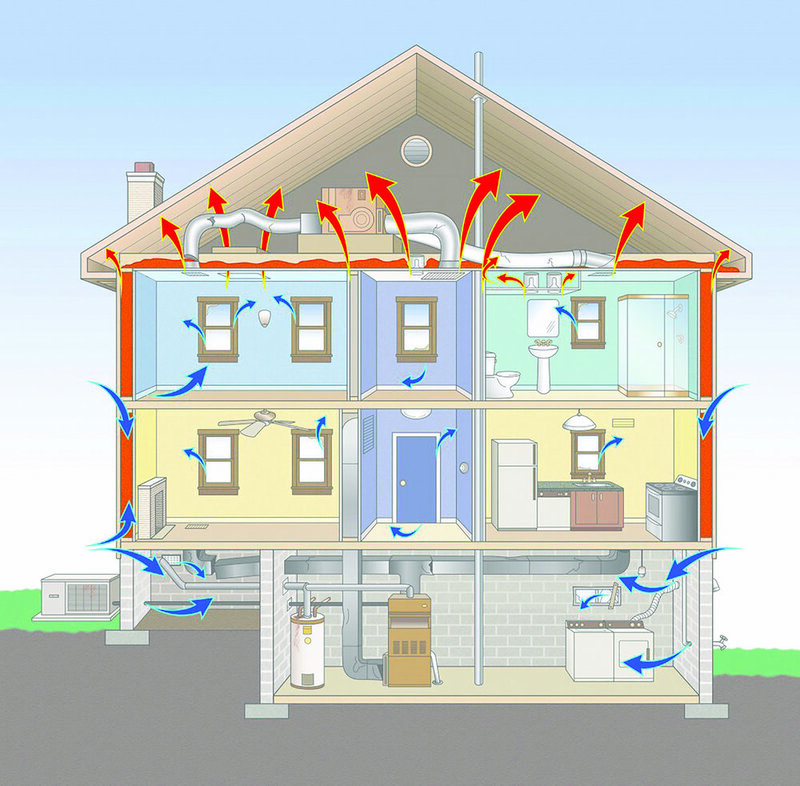 Air leaks out of a house at the top and comes in from the bottom, Burbank explains. As a result, when all the fresh air coming into a house travels through a wet basement where there’s mold, air quality is a top concern. Or, if the attic isn’t insulated, drafts at the top of the house could be financially devastating in the cold of winter or in prime air-conditioning season. Energy advisors in Maine often work in partnership with crews that do the insulation work, and almost all those crews do other upgrades such as carpentry, which comes in handy if you need to have a door replaced, for example. This makes it easier for the auditor to get “before” and “after” readings on blower door and infrared camera tests. Efficiency Maine has found that the number of rebate-eligible projects completed correlates very highly with customer satisfaction. “This is the secret sauce of our database,” Meyer says. He recommends using the “Find a Vendor” feature on EfficiencyMaine.com; first, select “At Home,” then “Find a Vendor.” Put in the zip code, select a radius of 10 miles or 25 miles, and sort by number of completed Efficiency Maine projects. What comes to the top of that list isn’t just the energy advisors with the closest offices but the advisors who have done the most rebate-eligible projects in the area. Will you do a full audit, with a blower door and infrared camera (as opposed to a “walk-through” audit)? What help do you provide with applying for Efficiency Maine rebates? Is there a cost for this service? How much will I need to pay up front? Do you work with a crew that does air sealing? And other upgrades? Do you assess air leakage again after upgrades are done? With what tests? Will I receive a written report of recommendations? This article is reprinted from the spring 2018 issue of Green & Healthy Maine magazine. Subscribe today!